As we only use innovative procedures in our offices and procedures, we routinely use platelet rich fibrin (PRF) in oral surgeries that involve hard and soft tissues, derived from the patient. 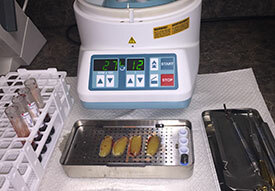 The fibrin proteins are collected in the office in a short procedure which only takes a few minutes. The use of PRFs in surgery ensures that the patient has the best opportunity to successfully heal from their surgery. No additives, chemicals, or foreign substances…only you. Tooth loss and damage to the jaw bone and tissues are often challenging for your dentist during oral surgery or implant placement. Without enough support in the jaw bone, dental implants cannot be immediately stabilized and tissue healing can be a long process. The solution to these and other difficult situations is a new Platelet Therapy created from your own blood. Leukocyte-Platelet Rich Fibrin (L-PRF) changes all the rules as it promotes healing and bone growth from within your own body. Unlike other treatments that use artificial components, Platelet Therapy with L-PRF uses only your own blood. With a simple blood draw and an advanced technology protocol, L-PRF is individually made for you, from you. The end results are improved healing response and significantly less recovery time. Medical research has demonstrated that using our own blood cells, accelerates healing and tissue regeneration in all forms of surgery. 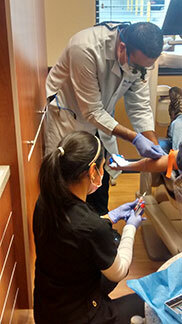 Specifically, platelets, fibrins, and white blood cells are used for this procedure. 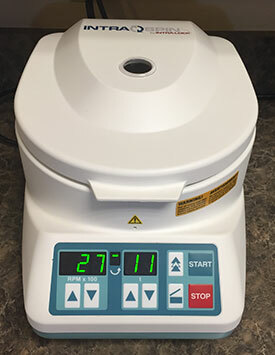 The protein that is carried by the platelets is the magic ingredient that is being used in numerous private office settings for wound healing and various surgical procedures, including oral surgery. A small amount of blood is collected to create an advanced bioactive compound that will boost the healing forces found within your own blood to improve your healing. The procedure to obtain L-PRF is virtually painless - no more so than a routine blood test. After a small blood sample is taken from either your inner arm vein or your top hand vein, the dental clinician will then use the IntraSpin System to create as many L-PRF clots as deemed necessary for your procedure. 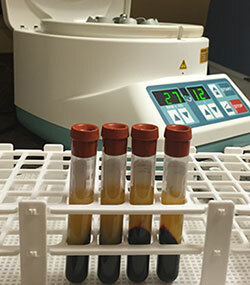 After the blood sample is taken, the tubes are spun using a very specific centrifuge and protocol. 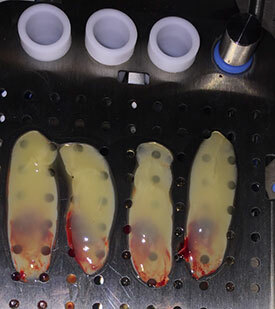 The L-PRF clots are then removed and pressed to the ideal thickness. After your L-PRF is created, it can be placed directly in or on surgical sites to immediately promote healing. L-PRF is also an excellent way for your doctor to apply other regenerative materials to a specific surgical site as needed. The L-PRF fibrin clot can be divided, combined with bone graft material, and made ready for any indication. L-PRF is basically a bioactive "band-aid" that is created from your own blood and then placed in your surgery sites to promote healing. When placed in surgery sites, L-PRF releases your body's own natural healing proteins, creating a more efficient network for cells to enhance the healing process for better and faster bone regeneration.